Early on Technobipophilia Sue Thomas points out just how exceptional “wild” is, and how manufactured or artificed are what many think of as “natural”: hedgerows and fields. She describes experiments in which viewing representations of nature are shown to trigger the same or similar effects to embodied immersions in the terrains represented (though none of the experimenters seem to have considered how that physical immersion in the real thing might be being translated through framing and organising ideas like ‘picturesque’). Thomas argues that, unless humans are to be given privileged and exceptional status (and that, surely, went with Wallace and Darwin), New York City is as natural as the Sun. Placing human artifice within the remit of nature does not, however, engage with the distinction between a glacier, hedgerow or Broadway and their representation. Biophilia” was described by Edward O. Wilson as the drive to “affiliate with other forms of life”. Sue Thomas builds out from this towards an idea of ‘technobiophilia’: an “innate tendency to focus on life and lifelike process as they appear in technology”. A lot hangs on and that “and”; it is used here not as a simple addition of like things but to gather “life” and “lifelike” together, even when the latter includes both simulacra and representational art. This introduces a powerful and resonant uncertainty into the narrative which is never fully given its head, but which agitates all the materials of ‘Technobiophilia’. Perhaps it is not possible, nor critically productive, to clearly distinguish between life and its representations, particularly in a domain that “does not actually exist”. Indeed, that ambiguity (captured in Carolyn Black’s illustrations) may be far more important than problematical; navigable mostly by aesthetic rather than biological or technological lights, and therein there may be a problem for the book, because the aesthetics here are Romantic and this has consequences for its cultural positioning. Web culture, at least in the discussion of itself represented here, seems to have largely ignored, leapfrogged or bypassed key developments in those visual arts, dance and non-theatre performances that have pursued reduction and negation; particularly notable by their absence are ideas around performativity, embodiment, somatics, phenomenology and the deregulation of signifiers and signified. There remains in cyber-pioneering a vibrant modernism that long ago fizzled out in much of the arts and critical theory. Among the programmers – “[W]e are the people who are out in front... The scouts... The finders of new ways” - there are avant-gardes, still. The camping expeditions of Geeks in the Peaks and the techno-nomadism seem rooted in hippie culture’s borrowing from earlier Western nature movements via Richard Brautigan’s pre-net vision of a cyber-meadow. Thomas very effectively contextualises cyberspace in a Californian psychogeography. She confronts the difficult colonial and genocidal histories of “apparently empty landscape” with its highly re-useable and de-originated flexibility, “freshness” and smokiness. The haze of human subjectivities constructing their own natures is one that might have been illuminated more with some reference to Judith Butler. Among few exceptions from a crass pioneer-geography are the members of a Microsoft translation project in the Canadian Arctic who settled for a translation of “internet” on a shamanistic term “ikiaqqivik”, meaning to travel through layers, effectively giving a sliding geography to invisible motion. There are numerous accounts of originary disconnection here – not so much from nature as from cyberspace itself - “an uncertain overarching and abstract domain which does not actually exist”. When William Gibson coined the term ‘cyberspace’ he had never been online. Stewart Brand “has never been especially immersed in the medium”. Jean Armour Polly, responsible for “surfing”, doesn’t like to swim. Sue Thomas is well aware of these disjunctures – her contrast between the mechanics of real world and online surfing is powerful made. But when it comes to the aesthetic shadings between a thing and its representation, there is a transparency not far from indifference. So an advert for a “portable Zen garden in your pocket... without the sandy mess!” ” could have been offered with a little more irony. Thomas refers to “a simulacrum of something else”, using the word in its more general definition of representation, rather than Baudrillard’s more degraded and ineffective ‘copy without an original’. But she goes beyond articulating signifier/signified relations and attributes a transfiguring, almost incarnating, power to representations: “[W]e may not see what happens in cyberspace as ‘real’... but the metaphors we use for it... can make it real.” The texts of MOOs may seem crudely literary on the page, but it is in the escapes from text, to an unreal visuality, to the made real, that most powerfully wend and beam their ways through these accounts. Examples of resistance to this – wooden keyboards for example – are marginal. When cyber-pioneers take to nature – “entrepreneurs, technologists, executives, bloggers... gathered at sundown around a flaming brazier and an upturned log to celebrate the launch of Google’s new OpenSocial initiative” – it is not always clear how far their engagement is with the terrain or with an idea of terrain they have brought with them, garnered from (and re-enacting scenes of) Marlboro ads and similar cultural products, like rambling. What is most powerful in the drive that Sue Thomas has detected and articulated is not so much an implied return to (or sustained and sustaining of) nature and/or its representations, but rather the part it is playing in dissolving the barriers between nature and representation. Given its apparently boundless uses of text, mostly uninhibited by binding, copyright or closure (all those fan novels and screenplays!) and its exponential metamorphoses of imagery, cyberspace has become like H. G. Wells’s door in the wall, collapsing the relevance of authentication, authorisation, valorisation. Yet, the philosophers and technologists of cyberspace quoted here largely seem to share the same real/unreal binary. Quoted at some length, Lawrence Lessig seems to think that “[P]eople live” in cyberspace, when what they are doing there is exchange information about themselves and other things (including their living). Here, some grasp of what, since Goffman, we have understood of the performance of the everyday, and of a life art/live art that is less about exchange of representations and more about presence, embodiment, abjection and the specificity of sites, might have evoked a more subtle landscape with which to counter the crudeness of Lessig’s description of people jacking out, getting up from the machine and abruptly “return”. Thomas seems to put her finger on some part of the problem when she seeks cyberspaces own story of origin. She describes the Kleinrock Internet Heritage Site and Archive: “Room 2011 3420 Boelter Hall, where the Arpanet was born... is a plain windowless room behind an ordinary door in a university of corridor, distinguishable only by a small plaque”. The elephant in the room is that there is no elephant in the room. Hypermodernity is struggling with its past; how to forge a legacy from virtual materials that struggle to offer a natural narrative of origins; it does not carry enough relevant ‘stuff’, it struggles for resilience, unlike clunky nature it struggles to persist: at least a third of the ‘map’ of cyberspace is now made up of “ghost towns and empty roads”. Compared to the use of resources in cyberspace open-cast mining and logging are models of socially-responsible enterprise. 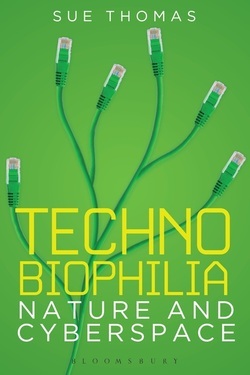 ‘Technobiophilia’ narrates all these disjunctures and, more importantly, implies and evokes a far more general fading of authoritative originals, but leaves its readers to evolve their own critical aesthetics with which to navigate them; perhaps that is a work to come.